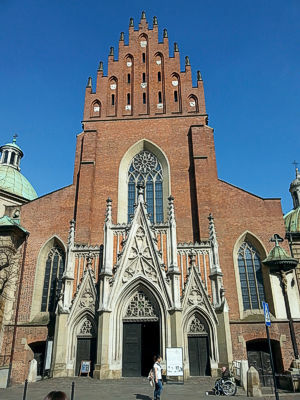 The large Dominican church of the Holy Trinity at Stolarska street and Dominikanska street, a three-minute walk from the Rynek Glowny central square, is a fine example of the Krakow version of Gothic architecture. It dates back to the mid-13th century and has been the stronghold of the Black Friars ever since. In 1850 the church suffered badly in the great fire that destroyed ten percent of the historic city of Krakow. And, unfortunately, the subsequent reconstruction hasn’t been quite accurate though it’s certainly unnoticeable to the untrained eye. In 1957 Pope Pius XII has granted the title of a minor basilica to Krakow’s church of the Holy Trinity. The vast Dominican monastery that adjoins the Basilica of the Holy Trinity was founded by Saint Jacek Odrowaz, better known abroad under his Latin name Hyacinth or San Jacinto in Spanish, who died in Krakow in 1257 and whose relics are enshrined at the church in an upstairs sanctuary-chapel. In 1289 Duke Leszek II the Black, the ruler of Poland from 1279, was buried next to the high altar of the church of the Holy Trinity. In the ensuing centuries it became popular among Poland’s aristocrats as a burial ground, which has resulted in number of mausoleum-chapels. Most interesting of them is the Chapel of St. Dominic (Kaplica sw. Dominika), also known as the Chapel of the Myszkowskis (Kaplica Myszkowskich), the last but one in the right-hand aisle, which dates from 1614 and can boast bas-relief portraits of 16 members of the Gonzaga-Myszkowski family who were buried here. In 1642 a picture of Saint Dominic was placed in the chapel’s altar and it soon became famous for miracles. The Chapel of St. Hyacinth (Kaplica sw. Jacka) overlooks the nave of the Basilica of the Holy Trinity. It’s reached by broad, easy stairs alongside the wall of the left-hand aisle of the church. A grille secures St. Hyacinth’s richly decorated mausoleum of 1700 and the glorious baroque altar/tomb with his relics standing in the middle of the room. According to tradition the chapel was originally the monastery cell where Saint Jacek lived in the 13th century. Better known abroad under his Latin name Hyacinth, he was born in 1183 to a Polish aristocratic family and died in Krakow in 1257. This first Polish Dominican friar ever earned himself a reputation of being the Apostle of the North on the strength of his extensive missionary work in Carinthia, Moravia, Bohemia, Russia, and Prussia. He also helped to establish the Dominican monastery in Krakow as early as 1222. The church of the Holy Trinity has been known for its sanctuary of Our Lady of the Rosary since 1668. It’s located in the 17th-century Chapel of the Rosary (Kaplica Rozancowa) with its entrance at the far end of the right-hand aisle of the church. Since 1668 the chapel has enshrined the miraculous picture of Our Lady of the Rosary, placed in the high altar of the chapel. The painting is a copy of the famous image called Salus Populi Romani, worshipped in Basilica di Santa Maria Maggiore in Rome. Another image of Madonna, placed in one of the side altars of the Chapel of the Rosary (the one facing the entrance), depicts the Blessed Virgin Mary dressed in a frock of a Dominican nun. It was brought from Rome to Krakow in the 18th century and for a long time compared favorably with the picture of Our Lady of the Rosary in the number of reported miracles. The Basilica of the Holy Trinity abuts one of three cloisters of the vast Dominican monastery which extends to the north. The 14th-century cloister is accessible both from the left-hand aisle of the church and through the monastery gate at Stolarska street. 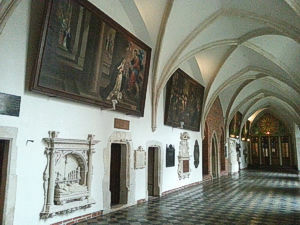 The spacious cloister exhibits historic pictures showing miracles that involved the Black Friars and scenes from the history of the Dominican Order as well as portraits of Dominican monks who were Polish bishops in the 13th, the 14th, and the 15th centuries. For many decades the Dominican monastery and basilica have been particularly popular with Krakow students who find here spiritual guidance, intellectual stimulation, and place where they can engage in good works of all kinds. The Basilica of the Holy Trinity at 12 Stolarska street and Dominikanska street is situated on the eastern edge of the Old Town historic district, just a three minutes’ walk from Krakow’s Rynek Glowny central square. The church stays open from 7 am to 8 am or longer but tourists should refrain from visiting when there is a church service. On Sundays and major Catholic feasts the Holy Mass takes place in the Basilica of the Holy Trinity at 8 am, 9 am, 10.30 am, noon, 1.30 pm, 3.30 pm (except July and August), 5 pm, 7 pm, 8.20 pm, and 9.30 pm. And at 7 am, 8 am, 9 am, noon, 5 pm, 6 pm, and 7.30 pm on weekdays and Saturdays. Poland’s second holiest shrine at the site of St. Stanislav’s 1079 martyrdom. Splendid Baroque church and fine monastery modeled on a Renaissance castle. Hilltop monastery-fortress dates from the 11th century. Magnificent 17th-century Baroque hermitage complex atop the Silver Mountain hovers over Krakow. Vast fortified complex on the Vistula river is home to Krakow’s once powerful Premonstratensian Sisters since the 12th century. Copyright © 2016, 2017, 2018 by MAREK STRZALA. All rights reserved.